To celebrate the real value of Manufacturing in Maryland, we must look beyond just recognizing great companies that bring value to our community. Manufacturing is a MINDSET; it is the creation of innovative ideas. How do we inspire the “excitement for CREATING things” in our future workforce? From the building of extraordinary glass architecture to custom, hand-crafted boats to beautiful architectural mesh, manufacturing is experiencing a renaissance of relevance. In Maryland, manufacturing is responsible for over 104,000 jobs and the generation of $23.4 billion in gross state product. With such a strong impact in our community, the sustainability of a vibrant, skilled workforce is imperative. The next generation is inspired by this industry and our work with the Untangled Minds Foundation and the AMP Program are examples of just that! We are honored to be recognized as Maryland MEP’s Manufacturer of the Month for the contributions to our community, clients, and partners. In our 25+ years of business, our mission to inspire everyone we touch through the creation of extraordinary glass architecture continues to touch lives around the world! To learn more about our product lines and services, talk with Jennifer Beletsky at 410.479.4700! 2018 Champions of Manufacturing STEM Awarded to Tanglewood’s Foundation for Education! Comments Off on 2018 Champions of Manufacturing STEM Awarded to Tanglewood’s Foundation for Education! Caroline County AMP students, founder of Untangled Minds Foundation, Alan Stein, Dr. Patricia W. Saelens Superintendent of Schools, Keith Hale, AMP classroom instructor receive the 2018 Champions of Maryland Manufacturing award for Stem Student Advocacy from Mike Galiazo (center), President of the Regional Manufacturing Institute of Maryland. Have you heard AMP in the news? To celebrate those in the manufacturing industry advocating for its growth in Maryland, each year the Regional Manufacturing Institute (RMI) recognizes several companies across the state of Maryland doing amazing things in the manufacturing industry in areas such as STEM Student Achievement and Recruitment, Innovation, and Community Engagements. This year, the Advanced Manufacturing Professionals (AMP) Program of Caroline County Public Schools recently won RMI’s 2018 Champions of Manufacturing Award for STEM Student Advocates! Awarded to those striving to impact student achievement in manufacturing, we were humbled to have received the award from our peers out of 280 nominations from across the state of Maryland. AMP was developed by the Untangled Minds Foundation, the brainchild of Alan Stein, founder of Tanglewood Conservatories in Denton, MD. The AMP program goes beyond the typical career and technology center manufacturing program. In addition to technical education, students learn about time and project management, cost estimating, team building, quality improvement process, communication, presentation, marketing and salesmanship. A blend of training in modern manufacturing process-driven thinking and the Life Success Skills that employer’s need, the AMP program relies on industry partner companies to deliver a multi-disciplinary approach to project based learning that brings real-world experience into the classroom. 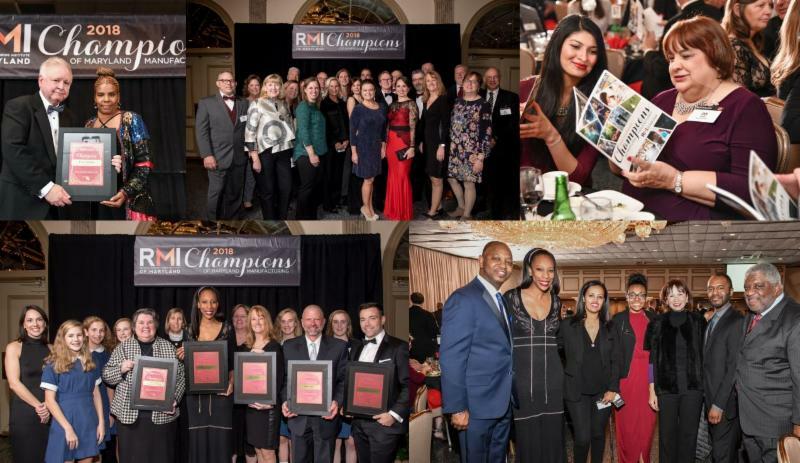 On Thursday night at Martin’s West, RMI’s 2018 Champions of Maryland Manufacturing Awards ceremony drew over 600 stakeholders from around the State. The evening awards program touched on the themes of togetherness and family as we celebrated a variety of different leaders from young students to business executives. 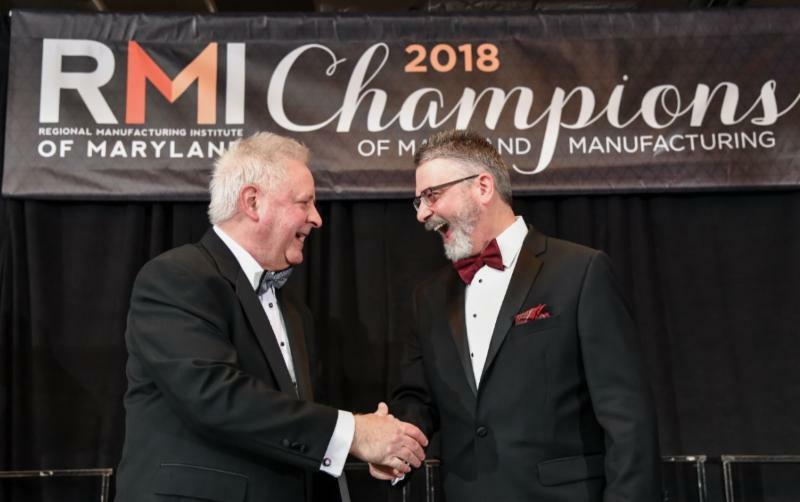 There were many poignant moments, from the embracement of the attending employees from GM Baltimore Operations to Suzy Ganz and Mike Galiazzo’s tribute to Aris Melissaratos as the 2018 Grand Champions of Maryland Manufacturing. Aris received a beautiful glass- blown bowl, see below, created with Maryland colors infused throughout, from Baltimore’s Magma Build Studios. Tanglewood Amplifies Local Trade Talent through Untangled Minds’ AMP program! Comments Off on Tanglewood Amplifies Local Trade Talent through Untangled Minds’ AMP program! Students of the Advanced Manufacturing Professionals (AMP) program dream of becoming a Master Craftsperson. One student’s passion for working with his hands led to a summer internship at Tanglewood. Throughout his internship, he experienced woodworking, metalwork, handling glass, painting, construction, and CNC machining, while helping craft Tanglewood’s luxury conservatories. Working alongside and learning from local industry professionals, students are currently designing and constructing a Cajon while preparing to take their Manufacturing Skills Standards Council certification; a nationally recognized industry program for advanced manufacturing professionals. The Cajón is the most popular and widely used Afro-Peruvian musical instrument for the last 200 years and is now used not only in Cuban and Peruvian music but by folk musicians, Flamenco musicians, acoustic groups, street musicians (buskers) and increasingly, professional mainstream artists. Students went all out on this project! The intricate detailing of this Cajon will test their skills. AMP student learns the intricacies of dovetail joinery as they work on the final assembly of their custom designed Cajon project alongside a master craftsmen from partner Hinckley Yachts. By the end of the semester, students will pursue internships with local businesses specialized in the trades. To follow the AMP students’ progress, subscribe to their newsletter HERE. AMP is just one of the many ways Tanglewood is giving back to our community and passing on our skills to the next generation. The program’s advanced approach to project-based learning fused with personal development is preparing students well in advance to walk into well-paying jobs and good benefits right out of high school. To support our youth in discovering their life vision and passions through advanced manufacturing and woodworking, donate here. 2 Continuing Education Units. 1 Amazing Mastermind Experience. Comments Off on 2 Continuing Education Units. 1 Amazing Mastermind Experience. You know from experience attracting the right clientele can be difficult. Plus, it’s easy to get bogged down in the day to day operations of your business. The best way to break through this common barrier is learning from others’ experiences, success, and failures to think creatively about moving prospects faster! That is why Tanglewood Conservatories in partnership with the Untangled Minds Foundation is currently developing an AIA Continuing Education Course to help architects do just that. This course will be designed to bring architects and other professionals together to assist one another in evaluating their current processes and ways of working with clients from three key perspectives: People, Business, and Life. Whether communicating to clients the value you bring to a project or getting others to make decisions in a timely manner, this course is designed to tap into your current systems and develop it into a well-oiled machine generating MORE QUALIFIED LEADS and INCREASING REVENUE without working more hours! Click here to receive email updates with upcoming event dates and details. For more information, contact Nicole Mihalos at untangledminds@outlook.com or call 410-479-4700! All proceeds donated to the Untangled Minds Foundation; a 501c3 nonprofit dedicated to empowering minds through educating them about the importance of leadership and entrepreneurial skill opportunities that lie beyond traditional mediums. Employment Opportunities at Tanglewood Conservatories! Comments Off on Employment Opportunities at Tanglewood Conservatories! Do you want to wake up and be excited about coming to work and building something awesome? Join our team at Tanglewood Conservatories! Will you share Rusty’s message with craftsmen you know looking for a REWARDING career? We look forward to meeting our new team member! Be a part of something great. Become a member of our team! What’s All The AMP About? Comments Off on What’s All The AMP About? It’s hard isn’t it? For some of us growing up, high school was nothing more than just a place you go to hang out with friends and learn things you’ll never use once you graduate. But for the students in the Advanced Manufacturing and Production (AMP) Program, going to class is much more than sitting and listening, barely paying attention; it’s about putting your mind, creativity, and craftsmanship to the test while learning practical skills that translate to real jobs after high school. If you were to walk into our event this past week, you would have seen a group of students passionate about making the most of their skills, and excited to start building their dreams (literally and figuratively) in the coming week. At Tanglewood, we improve our community by partnering with Caroline County Public Schools and local businesses to give students a chance to discover what drives their passion and build a career that is satisfying and will provide financial stability in an economy where university degrees aren’t always worth what they used to be. By giving students who are gifted in working with their hands an opportunity to pursue and develop their talents, we hope to prepare them to not only contribute to the economy of our community, but more importantly, to empower them to do what they love. And we agree. Being able to partner with several other businesses based on quality hand-made craftsmanship with an emphasis on creating a strong sense of community is a privilege and wonderful opportunity to pass on our skills to the next generation of artists and craftsmen. “WOW – the event was a hit! The attendance was great, and the students are genuinely excited about what opportunities there are when they graduate the program”. To learn more about the AMP Program, the Untangled Minds Foundation, and how you can get involved visit https://www.untangledminds.org/ and https://www.carolinebusiness.com/workforce/#cctc or join us at our next event so that we can continue to support the community and provide opportunities for growth for all of our students! People all over the country are finding the perfect gift for their loved ones, watching the delight spread across their face as dreams become reality right before their eyes. Many others choose to spread the spirit of the holidays by donating time and energy to charitable causes. Combined, we find the true purpose of the holidays we celebrate: bestowing joy in others and empowering our communities. Tanglewood Conservatories is passionate about this and fulfills this promise each day. Our team not only works to empower students and children through our Untangled Minds Foundation, we also work diligently to hire team members with similar passions. Meet our Global Sales & Project Manager, Mike Eline; a shining example of this dedication. His story serves as the embodiment of holiday spirit and kindness. As a member of the Salisbury Optimist Club, Mike and his fellow members organize community programs aimed towards providing children opportunities to grow in healthy and meaningful ways. Every year, Mike gives back to the children of Salisbury by dressing as Santa Claus and traveling around to the local homeless shelters, giving children the chance to experience the magic of Christmas. To many of these children, Santa is only a story, but thanks to Mike and the Optimist Club, the magic of Santa is brought to life. The children get to spend time with Santa, ask for presents, play games, eat, and most importantly, they get a framed picture of their family with Santa to cherish; a luxury these children rarely get to experience. When asked why he has participated in this event for such a long time (eight years running! ), Mike stated that as a father, he has developed a passion for improving the lives of our youth. We are inspired by the dedication of Mike and the Salisbury Optimist Club. They serve as an inspiration and an example of what love, hard-work, dedication, and a little holiday spirit can achieve for the community we live in. Do you know of an organization or individual who exemplifies the meaning of the holidays? Tag us on social media with your story! From our family to yours: Happy Holidays and have a WONDERFUL and PROSPEROUS New Year!